Rotherham manager Paul Warne has told fans to stop him in Tesco if they have a suggestion for a potential new signing. The Millers are looking for more additions ahead of the loan window shutting at the end of the month, having brought in Ryan Manning on loan from QPR last week. If Warne cannot get anyone else in ahead of the August 31 deadline he is ready to do business with free agents, and is open to hearing suggestions for possible targets. Warne told The Star: “I am not averse to anything. Someone recommended me a player the other day and he said, 'I don't want to tell you to do your job'. “It doesn't bother me, if someone stopped me in Tesco and told me his son plays FIFA every week and there's someone at Accrington, I'd listen. “I'm not too proud. We will look at new players, any option is a good option for us. “But I am really selective in what I like, they have to play a certain way. Manning came from QPR last Thursday to end Warne's long search for midfield reinforcements. He hopes that is not the end of his business before the end of next week. “Ideally I'd have one more, we are only ever one injury away from a bit of a problem,” Warne added. 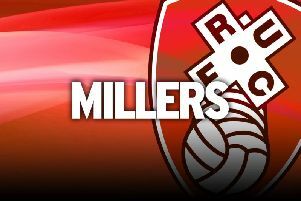 The Millers are back in Championship action tonight when they face Hull at the AESSEAL New York Stadium. They suffered a 2-0 defeat at Leeds on Saturday but came out of the game at Elland Road with credit, playing against a team who have started the season with a 100 per cent record. Warne is likely to choose from the same squad, with Manning hoping for a full debut.